Tsukushi District, from the 10-part set of Nihon fūkei hanga – Japanese scenery prints. 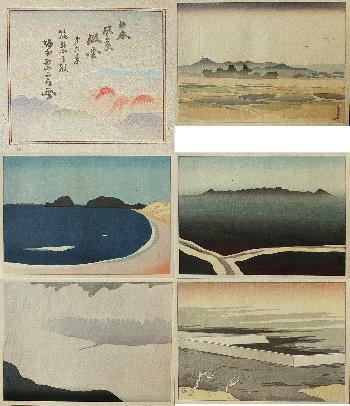 In its original folder, the set comprises five prints: Enobe, Kami (Tsukushi) Harbour, Mt. Mizusawa, Chikugo river and Sea of Fire, plus woodblock-printed frontispiece. Published on May 18, 1918, this set was the only one reprinted by Kato Junji (from recarved blocks) in 1970. Fine impression an colours, very good condition: all prints are attached to their original supporting sheets, and the cardboard folder is very well-preserved as well.